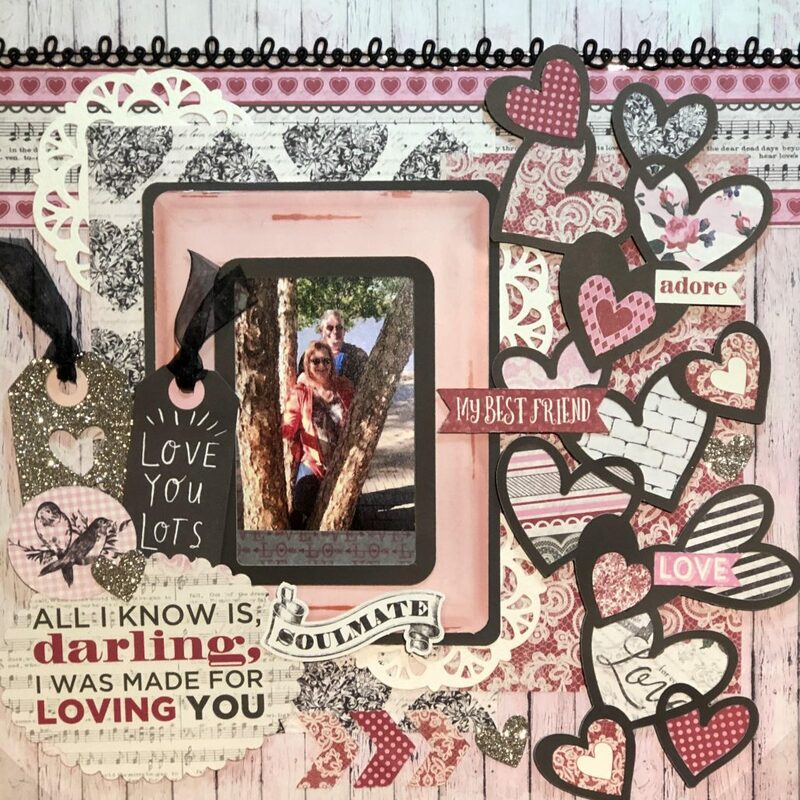 Design Team Member Melissa Bierlein came up with a GORGEOUS layout using her February scrapbook papers kit. Checkout the photos and her instructions and let us know your thoughts on this layout by commenting below! I absolutely love the vintage feel of this kit. For the hearts I used a cut file from Cricut Design space. 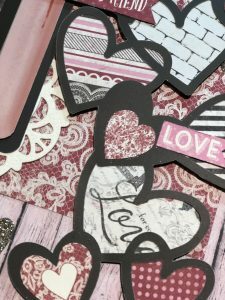 I used black chalkboard card stock from DCWV (this was used throughout the layout) I backed the hearts with patterned paper from the kit, die cuts and even part of a journaling tag. The frame on the photo has been in my stash for years! I liked they way the color was a transition from the pink to the coral of my sweater in the photo. 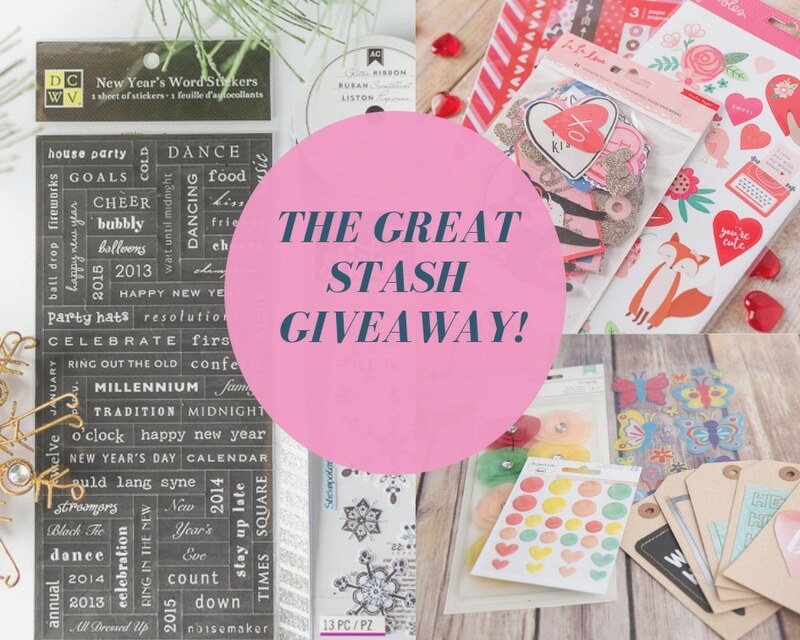 I used a washi strip from the kit on the bottom of the photo. 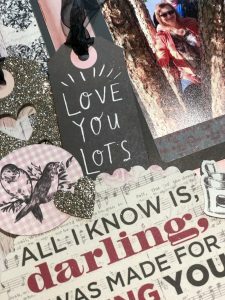 I loved this journaling tag I used in the bottom left of the page. It was perfect for this photo of my husband and I. Layering it with tags and diecuts from the kit really adds to they vintage feel. The swirly ribbon at the top of the layout helps bring out the strip of patterned paper I used in that same area. I added some die cut doily’s with cream textured paper behind the photo. I used a die that I purchased at Michael’s for these. I did distressed the edges of the diecuts used to add a bit of texture.